WE CAN SOAK UP SOME OF APRIL'S SWEET RAIN AND SPREAD OUR PETALS!! LETS MAKE THIS A GREAT MONTH. ONE OF GOOD HEALTH THRU HEALTHY LIVING! NOT MUCH GOING ON OVER HERE. YESTERDAY WAS NICE AND RATHER QUIET. DINNER WAS NICE AND WE HAD A NCIS MARATHON ON CABLE TV. SAVED THE MOVIES FOR ANOTHER TIME. I AM LIKING MARK HARMON IN THAT SHOW. LATER I TRIED PBS'S DEBUT OF MR. SELFRIDGE BUT COULDN'T GET INTO IT. TOO MANY ALARMS TO REPORT ON PAPER SO I AM HEADED DOWNSTAIRS. HAPPY....WERE YOU DREAMING OF A WHITE EASTER??? ONLY SUPPOSED TO DREAM OF WHITE BUNNIES!! HOPE YOUR DAY OUT & BRUNCH WAS NICE. WHAT DAY IS DH GOING IN? SENDING YOU A HUG FOR THE ELEVATORS AND PASSAGEWAYS TOO. PART 2: I SEE THE MEAL WAS GOOD AND SERVICE WAS BAD. I AM ALREADY SENDING DH GOOD VIBES AND JEN AS WELL. PRAYING FOR BOTH OF YOU TO COME BACK HERE AND MAKE A GOOD REPORT. CONCENTRATING ON NEXT WEEK IS A GOOD THING. JUST TELL HIM TO DO WHATEVER THEY ASK AND THINK GOOD THOUGHTS. Last edited by MELODY525; 04-01-2013 at 09:55 AM. I brought this post of Happy's because of her DH. and highlighted the part so we don't forget. Shad, I loved all your stories this last post - from the shoes to finding yourself amongst the men in the rest room. Apparently you were in such dire need to get in that you didn't notice the "special sinks" That was q good one, I had such a laugh DH had to call up from downstairs what I was giggling about. Sorry the trip to Kakadu turned out so water logged. I loved the pictures though. Laura - oh yum, there you go with that Greek soup again. Hope you enjoyed some for me. We had a lovely brunch. The food was spectacular. Our waitress service however was not. We were seated and waited about 10 minutes with no one in sight (this restaurant is known for it's not so great servers). Finally we went up to the buffet line and as we were returning the waitress looked at us and asked if we wanted something to drink. Ok with that. The rest of the meal she hovered all over the party of 8 next to us, talking and laughing and constantly refilling their drinks and removing dirty plates. DH said he thinks she knew the people as personal friends or something. Meanwhile we and the table of 2 next to us were ignored. We got no drink refills, she did not stop by to see if we needed anything and our dirty used plates sat on the table for most of the meal until 2 different waitresses passed by and removed them for us. Our waitress passed by several times attending to the people nearby but never once looked at us until it came time for the bill and then she was all smiles and cheers. Took her a long time to come back with the credit card slip as she went around and collected several checks and then came back with 8 tables of bills and tried to sort them out on the fly. DH wrote on the statement that we had recieved very bad service but I doubt the management cared much. For occasions like this as well as banquets and weddings, they often hire temporary workers. The important part was that the food was excellent and we had a nice meal. If I may, I would like to ask for any and all prayers and good wishes that all goes well. Not sure how often I will be able to post, we are not bringing our laptop with us and we have no cell phone to post from or call. His procedure is Wednesday morning. Thanks in advance, we'll take all the help we can get. It is April and I'm afraid I don't have time to set up a new thread right now. Perhaps someone else can take care of it otherwise I will see if I have time in the morning. Hope everyone had a nice holiday. Goodnight from me. Last edited by MELODY525; 04-01-2013 at 08:54 AM. Happy thought: Only 16 days till we are married....and 19 days till vacation/honeymoon!!! Had a lovely weekend. Samantha, Ainsley and Lil Man came over on Saturday, we went to lunch then back to my house. While the kids were out on the porch, I brought out the Easter baskets, then went out and said, OMG Ains the Easter Bunny came while I was in the bathroom. She said...HE DID??? ?...runs in the house to check out her basket then looks out the back sliding door and says, "NANNA, I THINK I JUST SAW A GLIMPSE OF HIS TAIL". I could barely keep from laughing. How stinkin' cute. HAPPY...you sly lil cat you! Putting out? Hilarious. My family all did Easter last weekend so all the kids etc could go to the other half of their family on Easter. I did get up and baked a 12 lb turkey, homemade dressing, deviled eggs, of course greenbean casserole, mashed potatos...then thought what the heck it is only me and C. So I called my dad, who is very sick with a cold and cough at the moment, and asked if he would like some lunch, my bro and SIL were there too, so we took all the food over and had an impromtu Easter lunch. They were all very appreciative. MELLIE....As for Peeps, I do not like them. It is way too much sugar and marshmellows, not fond of marshmellows either. Congrats on the weight loss. Slow and steady wins the race. Yeah! Love the flashing bunny. SHADWICK...sorry your weekend in Kukudo was a bust. Just crazy weather everywhere. I love that your job keeps you on an adventure, I live vicariously through your trips. LAURA...broken peeps ears are not good. When Sassy flips her ears back we always tell her she has broken ears. She is too cute. She got a new toy for Easter. It is a star shaped lil pillow that she drags around the house. It is about half the size of her. CEEG...are you/did you enjoy your time off in Jonesboro? That is about it for now....chat later girlies...it is APRIL...new thread? Annie's Awesome April Wedding with the Worldlies. HAPPY...sending up continual prayers for DH and for you! I HAD TO CHOSE ADVANCED FOR THE EDITING!! OH CHIT IT DIDN'T WORK. SORRY. 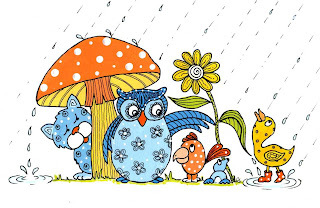 It is Easter Monday also known as Dyngus Day, meaning "Wet Monday", referring to traditional pranks involving water. It's also April Fool's Day so be doubly careful of pranksters hanging around the sink faucets today. Thank you Mel for setting up the new thread and for carrying over my post. I was trying to think of something fast for the April thread title, Annie's wedding totally slipped my mind. I think I would have preferred Wedding in the title as that implies drinking and eating, here now we have another month to behave ourselves and act properly and all that I cannot say I was all that good in March - mainly because we ate out of the freezer and pantry - too much salt and processed foods, not enough fresh stuff. I'm hoping the weather will start to improve alot so that we can go for walks and get moving more. Annie - tick, tick, tick - the wedding is just around the corner. Are you getting all excited? I hope it's lovely and that you have wonderful, sunny and unseasonally warm weather for your honeymoon so that you can enjoy every second of it on and off the beach. Your story about Ainsley was too cute. I'm not that much into kids anymore I must admit but I still have a soft spot for things like this where they are genuinely thrilled over the Easter bunny or Santa or a cake with 2 candles on it Dinner sounded delicious, how nice that you had some to share with Dad and Bro. I think alot of people are doing the turkey route instead of ham - can never go wrong with that and there is the lovely spring asparagus to enjoy also. Happy - I'm also enjoying hearing the birds when I go outside in the mornings now. My thoughts and prayers are with you and dh for a successful procedure, as well as best wishes for his speedy recovery. I'm glad you enjoyed the brunch. I guess it's good that it was a buffet and you didn't have to rely on the poor wait service for your food as well as beverages...I did enjoy a bowl of the egg-lemon-rice soup, enough for you and me both, lol. Bf and his mum ordered off the special menu and got the usual cup of soup with it, but my entree was ordered off the regular menu, which I guess didn't include soup with the entree, and so I ordered it separate and it was a bowl. It would have been enough to just have the bread, butter, soup and saganaki, aka flaming cheese But no, I ordered braised lamb with a side of those tasty green beans with tomatoes. Most of the lamb went home in a box, of course. Annie - Sounds like you had a lovely Easter Sunday - so cute with Ainsley catching a glimpse of the Easter Bunny!! And nice you ended up sharing your turkey dinner with your dad and bro. I'm not a fan of peeps at all, which is why that little basket from last Easter still had the Peeps in them and nothing else but a bit of fake grass, heehee. Naturally the chocolate eggs were long gone... Soooo, not long at all before your special day and then the best part - the honeymoon!!! I like your title. Mel - Thanks for setting up our new thread. Love the graphics, and a nice spring-y title too. Sounds like you had a nice Easter. I also agree that the ham steaks were a good idea, otherwise it's a LOT of leftovers for a LONG time, hahaha. Too bad about the alarms. Shad - Sorry your weekend was such a rainout/floodout. Glad you mananged to make it back safely. Flooded roads scare me! Funny story about the man and his fancy shoes and worrying about getting jumped - haven't heard "getting jumped" in quite a while. Hellos to Michelle and Ceejay! I did have time to dye the eggs. My hibiscus tea dye was a dud - I probably would have had to leave the egg in the tea for a few days to get an color transfer. I ended up adding red dye to it, and of course was disappointed with the nasty color - can't even get a nice pastel-y pink out of it. But I got some nice shades from experimentation with multiple color dunking. Took doggy on another nice long walk, and so we had three long walks over the weekend since I got home early-ish on Friday and walked him then too. I think he was tired and a bit sore in the hips last night though, so it might have been too much after all. BF will go easy on him today. Our dinner at the Greek restaurant was nice. Bf and I don't get there often and we'd like to go back for just lunch sometime when we'd just order soup and split a sandwich. I finished watching season 1 of Mad Men. Good thing - with all that smoking on that show, I was worrying about the effects of secondhand smoke, LOL. I will alternate between seasons of Mad Men and MOTG. Today is April 1, so it's time for another weight loss contest weigh-in. Thank goodness, it's at 11:00 am, so I should be able to survive no breakfast til then. I've scheduled a vacation day for Friday - yay. No plans yet except to use up a bonus restaurant gift card (that we got when we bought gift cards during the holidays). This card expires soon, so we need to use it or lose it! Okay, I need to stop the rambling and get cranking!! TTFN! A belated Happy Easter to all! Sending many, many prayers, positive energy and overall : to Happy's DH for a successful procedure and a complete and fast recovery, and sending much love, strength and prayers to Happy to help her through this stressful time. I am so excited for Annie and C's wedding!! I'm so excited I even have the Pointer Sisters' song stuck in my brain! I had a good weekend...got a lot done on Saturday and had a relaxing day yesterday...just me and Santa. Friday night and Saturday night, my roommate stayed in Milwaukee at her ex's house (he was out of town). We're getting along well. She's being understanding that I don't like being woken up in the middle of the night...so if she knows she is going to be out very late, she makes plans to stay at a friend's house. And she is very considerate about texting me to let me know if she is coming home and at approximately what time. I actually don't see her all that much. She works until 7, so she doesn't get home until 8 or so, and by then, I'm getting ready to hit the sack at around 9. She's going to go out of town with a friend who is taking a road trip to a conference somewhere along the Gulf Coast of Texas. She'll be leaving Wednesday morning and coming back Tuesday night. Her ex-husband will be watching her dog. It will be weird having the place to myself (with Santa of course) for so many days in a row. Yesterday, she went to church and was home by around 4. I was working on a "Vision Board", which is a pretty cool craft project...where you look through magazines and find pictures or sayings of your goals, dreams or want to make happen in your life. You cut out the pictures and make a collage, and you hang it where you can see it several times a day to remind yourself of your goals, dreams and desires. She helped me find and cut out pictures, and then cooked a yummy dinner for both of us so I could continue working on it. We spent several hours just talking about what we're both going through and all the changes in our lives and how we both have the opportunity to create the life we want. It was really nice to have some quality time with her. Today after work, I'm getting together for dinner with a friend, and then I have a hypnosis workshop. Tomorrow, I have a phone interview, followed by dinner with another friend. Any free time in the next couple days will be spent applying for more CA jobs. I'll try and get back in later for more personals. So...Laura....inquiring minds want to know...how did your Weigh In go? It's a beautiful day and I should be outside doing something. I did have a good time visiting with my friend. I've eaten out to many times this week end but I tried to keep it healthy. Went to church where my cousin goes and got to hear him preach. He does well. We ate out after church on Sunday and I spotted my aunt at the food bar. I knew my cousin couldn't be to far away. Sure enough she spotted me. She invited us to come sit with them after we finished. I'm so glad I got to see her. She's been having some health problems but yesterday she looked really well. But I do know one thing I don't want to live with her/ my friend. She wants to be waited on hand and foot. I'm not able to do that. Be sides I think she would be controlling. She mentioned that she wanted a house with a place for a lawn and garden. I may have spoke out of turn but I let it be known that I'm not able to do the yard work or to garden. I know no that I want my own space. Sending good vibes and prayers for your DH's procedure. Too cute about Ainsly thinking she caught a glimpse of the Easter Bunny. I missed all the fun stuff by not going to my sister's. Hello's to Laura and Michelle. Just remembered that today is rent payment day and I need to stop by the insurance office. They need some information for the renters insurance. Last edited by ceejay52; 04-01-2013 at 02:08 PM. Michelle - According to the scale used for the weight loss contest here at work, I've lost 10 pounds since the contest started on 2/1, and 4 pounds since the 3/1 weigh-in. (Of course all the scales read differently - my scale at home, the one for the contest, and the one used by WW. Thank goodness they're not drastically different - that would drive me nuts!) The final weigh-in for the contest is on 5/1. I'm happy with my progress, but I'm not a contender for winning or placing in this contest. It's been an extra little bit of motivation for me, though, and it's been fun. Our poor admin, she came back from her vacation to a 3-pound gain! Bad timing! Sounds like you had a nice Easter Sunday yesterday, and got in some good bonding with your roommate too. I'm glad everything's going well with your roomie, but it'll be nice to have the place to yourself for almost a week, won't it??. Hi Ceejay. I'm glad you had a nice time with your friend this weekend. Now get outside and enjoy the nice day! It's chilly and windy here today - wore my wool coat. This too shall pass....but WHEN???!! !